There are so many days that go by with me stamping something new, and I'm hoping to be able to use this blog to share my creations with you. It's my intention to post pictures of my finished cards (and other projects) to hopefully inspire YOUR creativity! Along with projects, you may see me posting tutorials (some might even be videos! 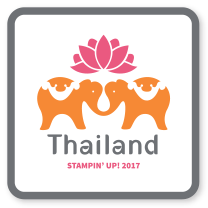 ), Stampin' Up! promotions and some of my upcoming events, as well as the occasional giveaway! I've spent this weekend building my blog and prepping for my monthly Stamp Camp. We are going to be making cards with the Pennant Parade stamp set from the 2012-13 Annual Catalog. Stay tuned, as I will be posting the photos of the projects we make at Stamp Camp tomorrow night later this week. I am always looking for people to share my love of stamping with, so I am happy to answer any questions you may have!